Even after our most heart breaking failures, parents, teachers and coaches encourage us to get back up and try again. Perhaps this is because they know that rather than being a permanent condition, failure is an opportunity to learn and improve. This was certainly the experience of Manfred von Richthofen. After cracking up his aircraft on his first solo attempt, Manfred went on to fly countless combat missions, racking up a confirmed 80 airborne kills and earning a place in the history books as The Red Baron. Manfred was born to an aristocratic family in Prussia (part of the German empire) in 1892. Along with his brothers and father, the title Freiherr (translated to Baron) was his birthright. At age 11, he began military training, and by age 19 (in 1911) he was assigned to a cavalry position with the Ulanen-Regiment Kaiser Alexander der III. von Russland. When World War I began three years later, it soon became clear that there was little use for soldiers on horseback in the trenches that crisscrossed the battlefields of Europe. Manfred and his unit were alternately assigned to work as dispatch runners, telephone operators and, eventually, supply officers. 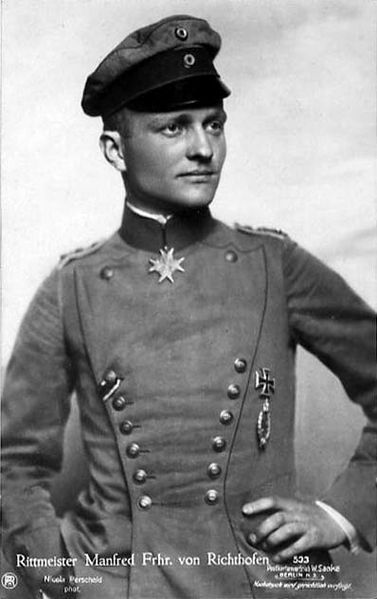 Disenchanted and itching for battle, Manfred requested a transfer to the air service, formally known as the Die Fliegertruppen des deutschen Kaiserreiches. Cheekily, in his application Manfred wrote: “My dear Excellency! I have not gone to war in order to collect cheese and eggs, but for another purpose.” He was formally transferred in May 1915. One fine evening my teacher, Zeumer, told me: “Now go and fly by yourself.” I must say I felt like replying “I am afraid” But this is a word which should never be used by a man who defends his country. Therefore, whether I liked it or not, I had to make the best of it and get into my machine. I started the machine. The aeroplane went at the prescribed speed and I could not help noticing that I was actually flying. After all I did not feel timorous but rather elated. I did not care for anything. I should not have been frightened no matter what happened. With contempt of death I made a large curve to the left, stopped the machine near a tree, exactly where I had been ordered to, and looked forward to see what would happen. Now came the most difficult thing, the landing. I remembered exactly what movements I had to make. I acted mechanically and the machine moved quite differently from what I had expected. I lost my balance, made some wrong movements, stood on my head and I succeeded in converting my aeroplane into a battered school ‘bus. I was very sad, looked at the damage which I had done to the machine, which after all was not very great, and had to suffer from other people’s jokes. Despite his early setback, Manfred kept at it, and officially became a pilot in the German air service on December 25, 1915. He joined the Second Battle Squadron in March 1916 where he arranged for a machine gun to be fitted onto his aircraft. His first credited kill occurred during a battle over Verdun, France on April 26, 1916. Over the next two years, Manfred shot down dozens of airplanes, and is credited with 80 kills all told. By January 1917, after his 16th confirmed victory, he was awarded the highest military honor given in Germany at that time, the Pour le Merite, also known as the “Blue Max”. About that time, he had his plane, then an Albatros D.III, painted red. Between the bright red plane and his aristocratic title, he soon became known the world over as “The Red Baron”. 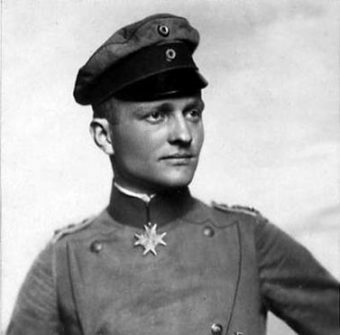 In the “Bloody April” of that year, The Red Baron shot down 22 British planes, and was named commander of the Jagdgeschwader 1, a unit of brightly painted aircraft that eventually earned the nickname “The Flying Circus”. Aim for the machine not the man flying it. Until you have silenced the gun, don’t bother about the pilot. Finally, aim for the man and don’t miss him. If you are fighting a two-seater, get the observer first. The best distance for shooting is 50 feet. On July 6, 1917, he suffered a trauma to the head that temporarily caused partial blindness. To remove bone shards, The Red Baron underwent several brain surgeries. Despite doctor’s orders, he returned to active service on July 25, 1917, this time in the iconic, bright red, three-winged Fokker Dr.I airplane for which he is best known today. Suffering from complications from the head injury, he was put on leave again until October 1917. Despite ongoing post-flight nausea and headaches, The Red Baron continued to have success in battle. Between October 1917 when he returned to duty and his death in April 1918, he racked up 19 more kills. During the last flight of his life, he was chasing a Canadian over Morlancourt Ridge in Northern France when another airplane came to the Canadian’s aid. The Red Baron was struck in the chest by a single bullet. Despite fatal wounds to his heart and lungs, he successfully landed his aircraft, but in allied territory. According to Sergeant Ted Smout of the Australian Medical Corps who was supposedly there at the death of the Baron, The Red Baron’s last word was “kaputt” (broken). A great debate raged at the time, and continues to this day, as to who precisely killed The Red Baron. Officially, RAF Captain Roy Brown was given credit. In Germany, however, many believed that Manfred was shot after he was on the ground; this theory being fueled by the reports of his comrades who observed his smooth landing. Others believe the reports of allied soldiers on the ground, who swear that either a rifleman or a machine gunner in one of their battalions shot The Baron. Regardless, The Red Baron died on April 21, 1918 at the age of just 25.